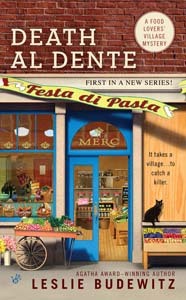 Six weeks to publication of Death al Dente, first in the Food Lovers’ Village Mysteries, on August 6 — and the Daily Inter Lake is talking about it! Also thrilled by this: On Thursday, August 1, I’ll be part of a local artists’ show at Frame of Reference gallery and frame shop in Bigfork. Owners Derek and Christine Vandeburg cooked up the idea of inviting local artists to show scenes of Bigfork — the model for the fictional Jewel Bay, the Food Lovers’ Village. I’ll be there, talking about the book and selling and signing copies. What fun! If you’re in the Flathead, I hope you can join me then — or at the Bigfork Festival of the Arts, Aug 3-4, or Huckleberry Days in Whitefish, Aug 9-11. And if you haven’t seen my new website, please take a look — it captures the spirit of the village quite nicely! Details on where to find Death al Dente on the Books page. This entry was posted in Food Lovers' Village Mysteries and tagged Bigfork, Daily Inter Lake, Frame of Reference, Whitefish by Leslie Budewitz. Bookmark the permalink.